Defibrillator Zoll M Series CCT SemiAutomatic Pacemaker Monitor, CRITICAL CARE TRANSPORT DEFIBRILLATOR with ECG & BP. The M Series CCT brings together ZOLL's superior biphasic defibrillation, external pacing, and complete monitoring in a single portable unit. At just 17lbs, it is 21% lighter and 48% smaller than its nearest competitor. Three channel 6.5in (16.5cm) color display Optional 2 invasive pressure lines Optional SpO, EtCO, NIPB, Temperature and 12-lead ECG. 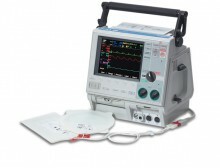 Three-channel color display, background rhythm analysis, three-lead patient cable, one rechargeable XL smart-ready battery, RS232 data transfer capabilities, carry case, AC power cord, one package recorder paper, two PC card slots, VGA output, operator?s manual, and standard one-year warranty for EMS use. Click the button below to add the Zoll M Series CCT SemiAutomatic Pacemaker Monitor Defibrillator to your wish list.